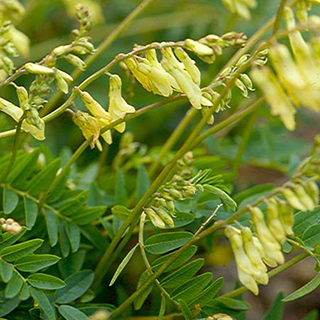 One of China's most important medicinal herbs, astragalus, the English word being milk vetch, is generally used as a tonic for younger people (whereas ginseng is the preferred stimulant for older people). It is particularly effective at strengthening the immune system and boosting energy levels, and is also used to clear abscesses and ulcers. Generally used in combination with other herbs rather than by itself: typically 1/3–1/2oz (9–15g) is added to Chinese tang ("soup"), a therapeutic decoction generally taken once or twice a day. It is used with ginseng (Panax ginseng) for general debility and fatigue, or with Chinese angelica (Angelica sinensis) for low energy, blood loss, or some types of pain. Take 40–80 drops (2–4ml) up to 3 times daily as a general tonic, to boost the immune system if suffering from fatigue with recurrent infections, or for conditions involving excess sweating. Widely available in commercial products that are generally marketed as energy tonics. Follow the dosage directions on the pack. Prefers full sun. Scarify seeds before planting 1/2in (1cm) deep and about 4in (10cm) apart in late winter/early spring in a prepared seed bed that contains sharp sand and is alkaline (above pH7). Thin to 12in (30cm) apart and only water when the soil dries out, as astragalus does not like wet ground. Dig the roots in the fall of the second or third year of growth and use fresh or dried.